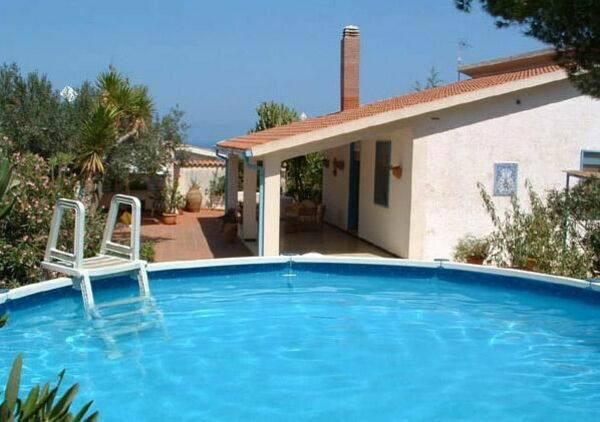 Blue and white villa situated in Castellammare del Golfo area, dominating Cala Bianca bay. The name of this beach comes from the natural color of the cliff. The property is furnished in a comfortable and elegant way, in a typical Tunisian style. The villa is completed by a dependence with two sleeps which – upon request – can be rented separately. Distances: Scopello, small village, famous in the past for its tunny-fishing nets and today for its characteristic Faraglioni, at approx. 2 km, Zingaro Natural Reserve at approx. 5 km, Palermo airport at approx. 40 km, the beaches are at approx. 400 m. At guests' disposal: large verandas, well kept private garden rich of typical Mediterranean vegetation, private round swimming pool (5 meters diameter - maximum depth 1,40 m – open from 01/05 to 30/09), barbecue, outdoor comfortable and well equipped kitchen (oven). The road which leads to the villa goes down to the sea (cliff), just 450 meters far from the property. Parking within the grounds. Ground floor: living room (TV) with fireplace, small well equipped kitchen (freezer), double bedroom with ensuite bathroom with shower, bedroom with three beds (1 single bed and 2 bunk beds), bedroom with french bed, bathroom with shower (washing machine). Access to the 2 verandas with panoramic view over the coastline directly from the living room.